Impulse! Records was established in 1960 by producer Creed Taylor as a subsidiary of ABC-Paramount Records, part of the American Broadcasting Company (ABC). Taylor had previously worked with the New York-based Bethlehem Records label, as its inaugural house producer and A&R manager. He set the scene for the label’s most successful period with his far-sighted signing of John Coltrane. He left Impulse in the summer of 1961 to take over the running of Verve Records. New recordings from the label ceased in the late 1970s, with ABC re-issuing classic titles until the company was sold to MCA Records in 1979. The label name has since been revived for new recordings only for short periods and is now part of Universal Music Group’s jazz holdings, The Verve Music Group, and relegated to a reissue-only label. Coltrane is no longer among us, and neither is the huge talent factory that was New York in the Fifties. 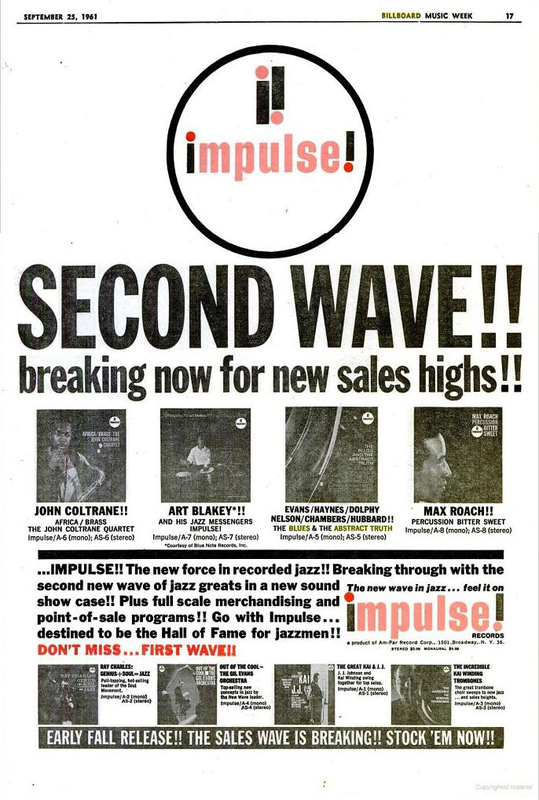 Impulse started off well, and maintained a steady course though the Sixties, but by the Seventies, along with a lot of the record industry, an output of poorly manufactured reissues not worthy of the vinyl they were pressed on. 1. Always look out for the US originals – orange/ black ring and, later, black/ red ring, with laminated thick card gatefold covers. US pressings will often have a Van Gelder stamp in the trail-off. Stereo is excellent and preferable, though the mono are no slouch. Don’t dismiss second pressings on black.red ring as a cheaper alternative, as mostly these are pressed from same metal as originals. 2. Always check the record label – later Impulse reissues are often found in jackets that look like the older originals. Avoid anything in flimsy jacket with ABC prominent in the branding. 3. UK collectors should head straight for HMV pressings, which were the UK licensed 1st release. Most of the first wave of Impulse releases 1960-64 were remastered for UK release by EMI on behalf of HMV and they are heavy vinyl (160-180 gm) and sound great. Most titles were UK-issued in only mono, select titles also in stereo. Impulse UK reissues in their own name are a significant drop in quality. I was looking at my 20 July, 2016 list of my ABC-Paramount record holdings and now provide an updated list. I actually had the additions without knowing it. Forgot to add Quincy Jones: Quintessence A11, which I bought a week ago. Here’s my list of ABC Paramount and Impulse LPs. I have few Coltranes because I heard him live many times. Wondering how the 3rd variation of the original orange circle / black ring with the “Product of ABC” size up. Specifically for Coltrane—Meditations. I don’t find fault with any of the iterations of the orange label/black ring, whether Am-Par or ABC Records Inc, dating from the ’60s and the successor black label red rim is generally pretty feisty. It is only into the early 70’s in the final years of the black label/red rim when the ©1972 started to appear that I have concerns about audio quality. That applies industry-wide to a lot of vinyl production, not to single out Impulse unfairly. Soundcheck – does this look like it – see postscript at foot of page – though this happens to be a Japan press by King, who usually replicated the original artwork and label design. Feels exactly like a Impulse LP. with heavy gatefold and RVG. Interesting, first time I have noticed King redesign a label for Japan. I have to say, this looks like an interesting release. Why don’t I know about it? I am trying to establish release Uk release dates for Coltrane Impulse records, particularly “A Love Supreme”. I remember”Live at the Village Vanguard” being on HMV lable. It seems from Ashley Khan’s book that a tape was sent from the US and cut by EMI. I don’t have any release date for some, and my Love Supreme edition is on HMV green label, not the usual black with Nipper in colour design – not something I have seen before. Hot 100 at No. 5: Lonnie Donnegan, Does Your Chewing Gum Lose Its Flavour (on the bedpost overnight). LJC, because I’m a little boring, I checked a few of my UK Impulses releases on HMV and they were all made from US metalwork with an RVG stamp. This seems in line with other HMV releases of ABC product – my Ray Charles LPs are all from US stampers. The 1968 releases on UK pressed Impulse are remastered in the UK. Dean – have you been smoking something you shouldn’t? I have just pulled ten HMV Impulse releases all 1963-4 ish, Coltrane, Mingus, Roy Haynes, Elvin Jones, every single one is an EMI UK pressing with UK matrix machine stamped in the EMI fashion (following the curve of the record) and no other markings in the runout. Some have UK Purchase Tax stamp by the spindle hole. No sign of US metalwork, no RVG no Van Gelder on HMV. I have uploaded a comparison between Impulse metalwork and HMV Impulse for the two closest titles I have – A5 and A6 at the foot of the post. Have I missed something? All of mine have the US catalogue number in the run-out groove, but nothing else. Now here’s a conundrum. I presume those aren’t UK cut masters, because standard form would be for EMI to use their UK catalogue number. On top of that in research on Ray Charles UK pressings a colleague of mine found they were all produced from metalwork sent from the US. The run-outs had the same form of US cat number printed in. Your pictures show that with Impulse the catalogue numbers were scratched in rather than stamped. Is it possible that ABC cut special metalwork for their overseas releases? More research I think. I’m off to study some more run out grooves! Prestige were supplying US stampers to Esquire right up until their demise – 1963-ish. Not impossible Impulse did too, but surely they would have been RVG derivatives. Why go to the trouble of cutting a new master without RVG just to send metalwork to the pesky Brits, when you had RVG master stampers in hand? Still, manys the time I’ve seen stupid things done. I’m pretty certain I’ve seen that curved machine stamp on EMI Hayes pressings over a wide range of titles, not just Impulse. Interested in any other theories. I just took delivery of a 1976 Japanese pressing of Coltrane / Hartman with the green bullseye label. Thicker vinyl than US pressings of that era, stereo and sounds wonderful. Pressed by Nippon Columbia with slight label variations. Let me know if you’d like to add the label to your list. I always like to add a Japanese variant to the label guide. Send the label. The labelography fundementalists may sneer at non-US editions, but out here in the tiny backwaters of Europe and the even smaller “rest of the world”, sometimes that’s all we see. What with the recent hike in US postal charges, US ebay sellers demanding expensive tracking on top, plus the risk of customs charges, buying from America is looking a lot less attractive.